Did the Penguins seriously fail to recognize that Mike Cammalleri was the one player that could consistently burn them? Montreal eliminated both Crosby and Malkin all series, why didn’t the Pens play Cammalleri in the same manner? How did the Penguins (and the Capitals as well) manage to make Hal Gill look like a number one defenceman? I watched him play in Toronto and he was certainly better than I ever thought he would be and he was able to play a shut-down role sporadically, but these playoffs he has turned into Chris Pronger. How? Who is a more unlikeable player, Dan Carcillo or Maxim Lapierre? Why didn’t the Penguins consistently dump the puck into Marc-Andre Bergeron’s corner and hit him relentlessly? Bergeron is a marginal defenceman under optimal conditions, how bad would he be under constant duress? Is Brian Gionta legally classified as a dwarf or is he simply an oversized midget? Is the fact that P.K. Subban became Montreal’s best defenceman after Markov’s injury more indicative of his tremendous skill or how bad the rest of the Montreal defence really are? Montreal fans can’t even pretend that they’ve enjoyed the work of Roman Hamrlik this year. Are Hab fans going to thank the Leafs for turning Dominic Moore into a third line superstar? He’s scored a few big goals. Sure the second round pick the Leafs received a few year ago was nice, but they should never have put that waiver claim in on him if this is how it all turned out. How many chins does Jaroslav Spacek have? Does Gary Bettman not know how to fix a game? What was Marc-Andre Fleury doing before and after each game? He was awful. Either the Montreal party scene engulfed him or his family has mob ties and they squeezed into throwing the series. Did I mention he was awful? Did Sergei Gonchar do irreparable damage to Russian defencemen everywhere with his laughably poor attempt to stop Montreal's short-handed goal? I was furious and claimed that’s what they get for putting a Russian on defence. And two of my favourite Leaf defencemen were both Russian (Dmitri Yushkevich and Dany Markov). That play will confirm a lot of stereotypes. Little Dmitry Rushenko better stick with forward because he’ll never get a chance to play defence in the NHL. That brings up the question whether any Russian actually grows up wanting to play any sort of defence. I'm lashing out here! Are the Canadiens only able to bring it against teams far superior to them and will they have troubles solving the horribleness of the Bruins or Flyers? Is anyone going to demand Jaroslav Halak take a drug test? I want to see that urine. No way it’s clean. Now that the Habs are advancing to the conference finals what are the odds that Don Cherry learns how to properly pronounce Jacques Martin's name? Will he insist upon calling him Jack Martin? 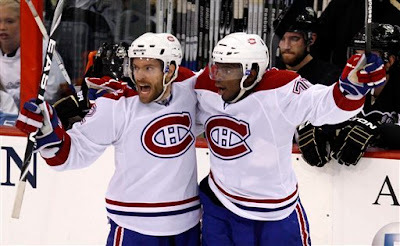 Are the Habs going to ride this wild momentum right to a Stanley Cup championship? I’d wager a lot on Chicago and even San Jose beating them, but anything can happen in a seven game series, so I’d be worried, especially since I was 100% sure both Washington and Pittsburgh would beat the Canadiens handily. How long will Montreal fans completely forget about Scott Gomez’s contract? Does being a part of this magical team give him a one year respite? He wasn’t bad this year by any means, but he wasn’t anywhere near $7.35 million good and that sort of thing doesn’t go over well in Montreal. This contract is going to be an anchor for the Habs, especially now that Plekanec becomes a UFA after the season and soon-to-be RFA playoff hero Halak will wear a mask to rob them blind. Is this going to give new life to the stupid argument that Sidney Crosby can’t bring it in big games (like nobody watched the Olympics)? Are the Montreal Canadiens seriously a team of destiny? Will I be able to get through these playoffs with my sanity?